Valentine’s Day is just around the corner and these Hawaiian Haystacks are the perfect way to celebrate with your loved ones. They are so easy to make and everyone you love, from young to old, will enjoy this festive meal! Have you planned your Valentine’s Day dinner yet? I have to admit, when my kids were young, I looked forward to Valentine’s Day dinner OUT. But the older I get, I avoid dinner out on Valentines Day like the plague! We usually go to lunch at a nice restaurant but dinner is usually enjoyed at home! What to make when you’re trying to please the kids and your sweetheart too? This recipe for Hawaiian Haystacks will save the day. It’s the perfect family-friendly meal, even for the pickiest of eaters. 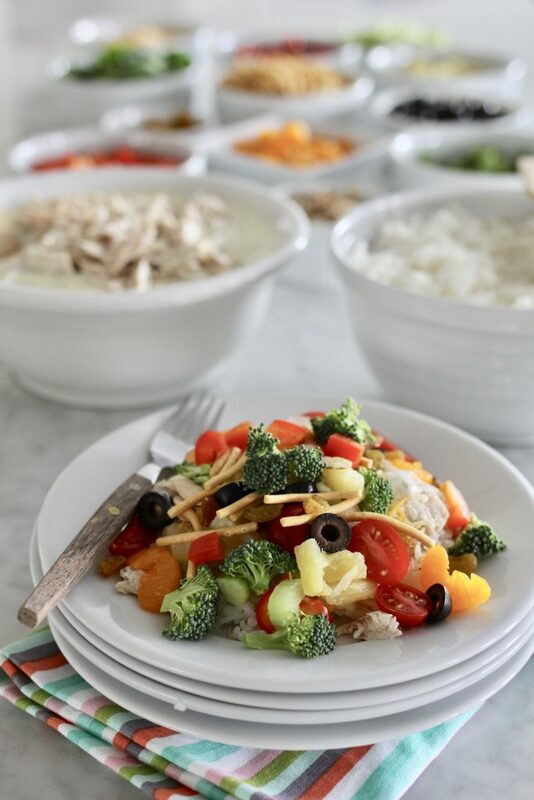 Hot rice and creamy chicken, topped with yummy foods like pineapple, coconut, sliced almonds, or cheese. 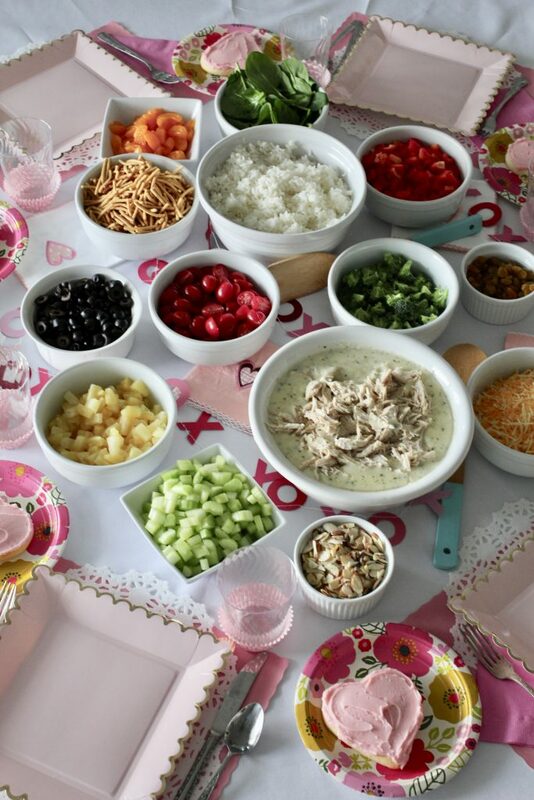 All you need to do is prepare the chicken mixture and rice, and let your kids and/or guests pick their own toppings. Hawaiian Haystacks are great to serve at large gatherings, such as family reunions, banquets, Girl’s Camp, parties and other events. 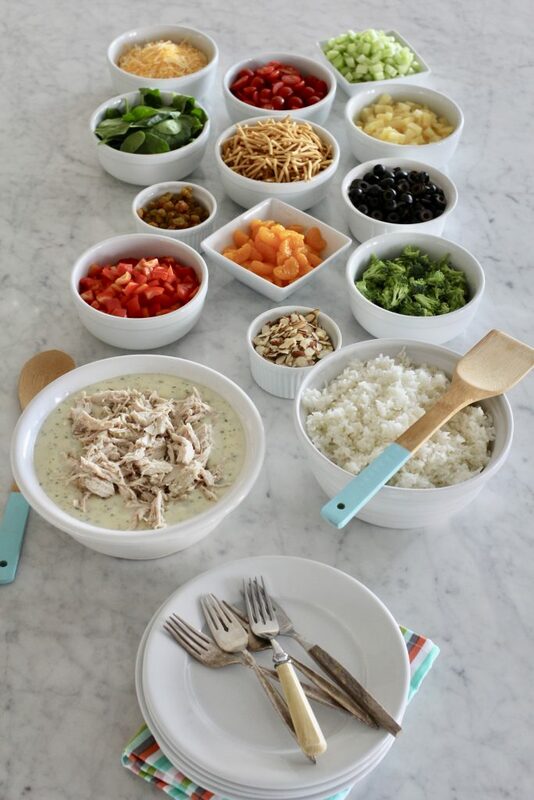 Simply make the main dish, serve buffet style and your guests can bring some of their favorite toppings as well if you want guests to contribute to the meal. It’s a win-win for everyone! This recipe for Hawaiian Haystacks feeds a crowd in no time and everyone can adapt it to their own liking! I love meals that are easy to make, that feed a crowd. You can also make ahead. Simply refrigerate the chicken after cooked, as well as the sauce, and on the day of serving simply heat it up a bit on the stove or in a slow cooker. Perfect prep for busy weekdays, weekend events, or any occasion. This recipe for cooking chicken in the Instant Pot is the best and easiest way to cook a batch of chicken to use in recipes. Confession. I’ve never made Hawaiian Haystacks before developing this recipe. For years, readers have asked for a Hawaiian Haystack recipe. I have only eaten Hawaiian Haystacks once at a Boy Scout dinner years ago. All I remembered was chicken, rice and a whole lot of toppings. In my research, I found most people make Hawaiian Haystacks using Cream of Chicken soup, but I wanted to make a version using a from-scratch sauce. You can also make the sauce using two cans of soup, one and a half cups of milk and 1/2 cup of mayo, whisked together if you really love canned soup! I think the home made version is as good as it gets! Taking a few extra minutes to make the sauce homemade will make all the difference in a sauce that is ho-hum, to over the top delicious. Serve Hawaiian Haystacks buffet-style this Valentine’s Day for your sweetheart and family. They’ll fall in love with you all over again! ​Valentine's Day is just around the corner and these Hawaiian Haystacks are the perfect way to celebrate with your loved ones. It's so easy to make and something everyone, from young to old, will enjoy! Add chicken broth and half and half. Combine cornstarch and water in measuring cup, mix until smooth. Add cornstarch slurry to the skillet. Heat, stirring until thickened. Add chicken, vinegar, parsley, salt and pepper - heat through. 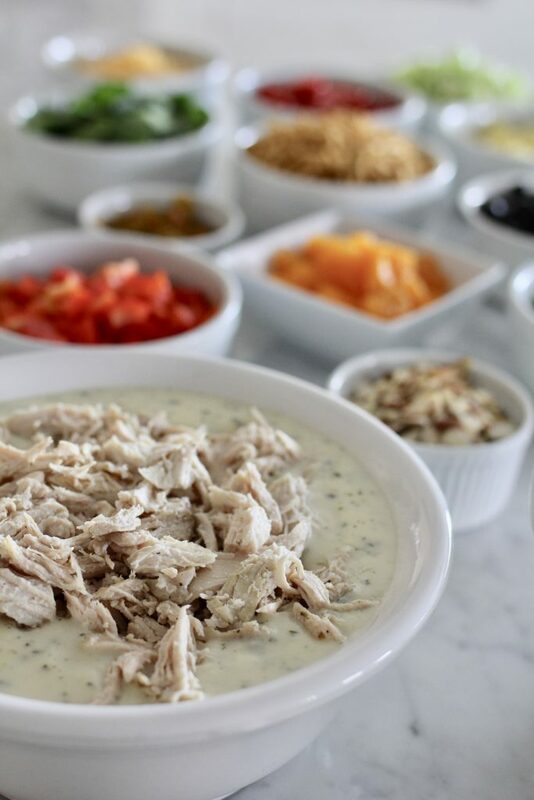 Serve with cooked brown or white rice and toppings in individual bowls. I’ve loved following you on instagram and have tried a number of your recipes. This weekend I made this recipe and loved it. 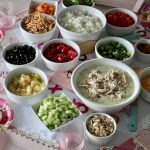 I am not a fan of the cream of chicken soup but have always used it in my haystacks. I loved this version and will use it going forward. Everyone loved it. Thanks Liz! I’m glad you’ve this recipe a try. I agree, anything homemade is better than using a can, and making your own base for Hawaiian Haystacks is so easy. Thanks for reading ABK! I’m not a huge fan of cream of chicken either, Liz. It tastes so much better with quality ingredients. Thanks for sharing and for reading ABK!